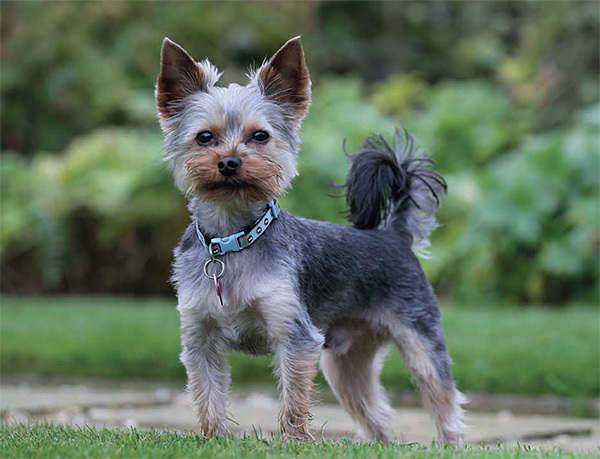 Classified as a Toy dog, the Yorkshire Terrier may be small, but try telling him that! Very playful, happy and keen to please, the Yorkie makes a great companion for all ages. Yorkshire Terriers may be tiny, but these dogs have big personalities — and don’t they just know how fabulous they are! These little pocket rockets have so much to offer. Yorkies will bark when people come into the house but, as with any breed, you can train them into better behaviour — but if you let them yap, they will! It’s down to the owner to train them and let them know who’s boss. Diana says Yorkshire Terriers can be quite protective over their people and properties, but they will never be vicious or aggressive, making them great family pets. They’re also good with children and other pets. Despite his small stature, the Yorkshire Terrier is brilliant at activities such as agility and obedience, with many classes offering ‘mini agility’ for smaller dogs. Yorkshire Terriers can be prone to cataracts, which tend to develop as they get older, from around 13 years and over. Diana says: “Smaller dogs have smaller joints, and can therefore have joint issues and knee problems as they get older, especially the so-called ‘teacup’ Yorkies. If you get a long-haired Yorkie, you’ll need to give his coat a daily brush, or have him clipped regularly. The Yorkie coat is very fine — much like human hair — so needs extra care and attention if you intend to keep it long, and especially if you intend to show your dog. The breed dates back as far as the 1800s and owes its origins to the old working Black and Tan Terrier, with infusions of Maltese and Skye Terrier blood. It is thought that Scottish labourers travelling to work in the mines and cotton mills of Yorkshire brought their terriers with them, and these provided the basis of the breed. A dog named Huddersfield Ben, born in 1865, is credited as the foundation of the breed. The placid, small-built dogs soon became popular with ladies as house pets. The breed was officially recognised by the Kennel Club in 1886, and The Yorkshire Terrier Club, one of the oldest breed clubs in the UK, was founded in 1898. Yorkshire Terriers have proved very popular among celebrities, with A-listers including Natalie Portman, Whitney Houston, Joan Rivers, and Britney Spears all owning Yorkies during their lives. You can also spot many Yorkshire Terriers in popular films, including the terrier belonging to Mrs Coady in the 1988 John Cleese film, ‘A Fish Called Wanda’, and Sharpay Evans’ pet dog, Boi, in hit teen flick, ‘High School Musical’.